Logitech C920 Webcam Mac Compatible? Logitech keeps raising the bar when it comes to building state of the art, premium webcams for Mac and PC. Their popular HD model, the UVC compliant Logitech C920 took their web cameras to the next level with unique features we're starting to see elsewhere in the web cam market: H.264 video compression support built into the hardware, optical quality glass lenses and stereo microphones. The 920 is Mac compatible and functions AOK on OSX 10.5+ and is recognized by most Mac video apps. Past versions of Logitech's webcam capture software for Mac initially didn't recognize the C920 when plugged in, but it's now fully supported. Recently, the C920 has now been superceeded by the C922x Pro Stream model. In the revised C922, Logitech improved the circuitry to deliver higher frame rates. However, with a now lower street price, the C920 is still an excellent choice for Apple computer users wanting 720p or 1080p HD streaming and capture on MacOS. As webcam resolutions increase - the demand on computer bandwidth becomes staggering, especially as we move from 720p to 1080p high-definition modes. It's just a TON of data to deal with. To keep data streams manageable - and to save significant disk space when capturing video to your hard drive, H.264 is a huge advance in reducing data size dramatically while preserving a very, very high quality image. It's so efficient and so good that it's been adopted widely across the computing universe, most notably and recently in the Blu-Ray DVD standard to deliver stunning images and still fit a feature film on disc. It's also one of the many CODEC's bundled into Apple's QuickTime software. As it applies to Logitech's MacOS compatible C920 web camera, OSX users are getting the benefit of H.264 compression built into the webcam's hardware. That means a better experience streaming live video. And video capture will use less space on your hard disk or SSD, and make file uploads to sites like YouTube faster. Like Apple - Logitech is a premium technology company that has a long tradition of designing and engineering stuff better than many of their peers. And as the leading webcam manufacturer, they're always the one to beat. Not all Logitech webcams are stellar performers. At the low-budget end, their 'budget' cams scrimp with low-end OEM components that other cheap webcams may use. So look to the mid-range to high-end models for a Mac webcam you can enjoy for years to come. Macintosh compatibility, marketing and support were a weak point for many years. In the early days, a few of their webcams were in fact Mac compatible, but they didn't advertise, market as such, nor provide technical support. That changed when the Apple Stores first opened and a supposed 'Special Edition' model of the 1.3MP QuickCam Ultra Vision SE Webcam was packaged for Apple retail. Logitech webcam support more officially debuted with the now discontinued, but still available Quickcam Vision Pro for Mac Webcam which offered not only UVC Mac compatibility, but HARDWARE auto-focus, RightLight2 technology, and world-class Carl Zeiss glass lens optics. It may have looked like a QuickCam 9000 for PC's on he outside, but had different internal hardware. Unlike the QC 9000 it didn't rely on (Windows ONLY) software for autofocus and light management. The Vision Pro was replaced last year with the best Mac compatible webcam made to date: ThePC and Mac Compatible C910 HD webcam. The color fidelity, light sensitivity and mind-blowing carity and detail sets the standard for all web cams from here on out. Recently, a slightly more affordable Apple friendly webcam model with similar qualities with a Non-Zeiss glass lens - the Logitech C615 Mac Autofocus Webcam was added to Logitech's Mac webcam page as having 'official' Mac support. 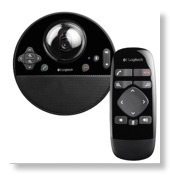 The reality is that other lower-end Logitech web cameras will work on a Mac. For instance, tests of a plastic lens C510 worked in all Mac chat apps and had good sound fidelity and an image quality basically comparable to the built-in iSight of my 2 year old MacBook Pro.